The GIR5000 series analysers are ideal for biogas applications. These gases are usually a mixture of methane (CH4) and carbon dioxide (CO2) together with oxygen (O2) and hydrogen sulphide (H2S) which have implications for efficiency and safety. Two or three gas versions are available in a variety of configurations and all are ATEX certified. Methane and carbon dioxide are both greenhouse gases (GHG). Methane is an important fuel gas for CHP engines, if not used as fuel then it is flared off to produce the less harmful carbon dioxide. Hitech use NDIR sensors to measure methane and carbon dioxide. These are sensors specially designed to withstand the damp, corrosive atmosphere often found in these applications. 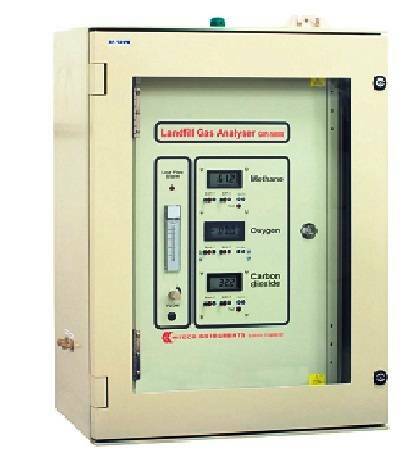 Oxygen is an important process indicator in both landfill and digester gas. In landfill gas, a low reading might indicate the presence of an underground landfill fire, whilst a high reading may indicate over extraction from the site. In digester gas, a high reading may indicate a decrease in microbial activity due to poisoning. For this application Hitech use a special electrochemical cell designed for use in the presence of acidic gases, e.g. carbon dioxide. Hydrogen sulphide is present in landfill and digester gas in varying amounts depending on the substrate composition. Hydrogen sulphide can be extremely corrosive to generator sets and continuous measurement can prevent costly damage. Hitech have developed a unique system which allows for continuous measurement of H2S. At 2000ppm H2S, good sensor lifetime can still be achieved. Sample conditioning is important in the variable conditions encountered in this application. Hitech provide internal filters, an internal pump and low-flow alarm as standard. An external coalescing filter is highly recommended and cooling options can also be offered to remove water. The enclosure itself contains a small heater to ensure that water vapour does not condense in the analyser. Hitech are ready to recommend complete systems on receipt of full gas stream specifications.